Alex Kavanagh is a pedantic physics geek – a teacher who hates teaching, a lover who’s always getting dumped, a writer whose articles all get rejected, a 28-year-old still living at home and bullied at the bus stop by teenagers – and he’s just had the worst day of his life. Things can only get better, right? Enter his ex, Lucy, in what seems to be a chance meeting. Her betrayal marked the point when his life went nuclear. But – holy protons! – he still loves her. Two problems. First, she isn’t who he thinks she is. Second, she’s going to leave him forever in 72 hours. Cold Fusion 2000 is a haunting novel about a man who’s too rational to believe in ghosts and too short-sighted to see what was in front of him all along. 5* "A beautifully written story that I thoroughly enjoyed. [...] The ending sure was a twist I didn't expect. I thought I had it all figured out. The story really sticks in your head after you've read it." "Cold Fusion 2000 (CF2K) is a novel of incredible genius. [...] Now, you may think that this is going to be a straightforward lost loves romance story, but I would like to point out that this is not the case. Should you pick up this book, be ready to be surprised. And be vigilant. Every word in this book could be treated as an indicator of things to come, every chapter could hide the ‘a-ha!’ moment that helps you connect the dots! [...] I was mind blown. [...] Bottom line- a great contemporary novel with a complex main character I came to care about. I was 100% committed to the journey Alex had to undertake and thoroughly invested in seeing the destination… Reading this book felt real and at times sad, but also full of hope and with a promise of new beginnings." 5* "Drinkwater’s writing makes you keep on wanting to read and find out what happens next. Alex’s sister, Natalie the live-in friend, the family dropping in whenever they feel like it, are all so realistic, it feels like you’re living in the book with the characters. Then Jane makes an appearance and turns their lives upside down. [...] From this point, it becomes a story of redemption, of realisation, of finally behaving like a grown-up, and you see Alex in a different light as he struggles to become the man he’s always wanted to be. [...] I thoroughly enjoyed this book, and will probably re-read it at least once more to pick up some of the more subtle clues and references I missed the first time around, as I was concentrating on the story! Well written and edited, it also earns a Pink Quill Book Pick badge." "This book is a fun, funny read but also has a lot of depth to it. It's a bitter-sweet book meant for a more mature audience. [...] The dialogue is fantastic. [...] The book has almost feels like Space Odyssey 2000 crossed with Big Bang Theory. If you want a smart read where you need to figure things out, this is for you." "Karl Drinkwater has a particular talent for taking quotidian events and everyman characters and crafting them into something really special. [...] Karl Drinkwater brings [these events] to life with clever observations, scientific facts, poetry, Mancunian geography and realistic dialogue. An enjoyable and satisfying read, with a clever plot twist to boot. Well worth a read." "The writing is wonderful. The dialogue is real and descriptions are poetic. [...] The fact this author writes this well about physics, English, poetry, and art, leads me to believe he either did an enormous amount of research, spoke to someone who was knowledgeable in these fields, or he has knowledge and has studied these areas. As well-written as it is, I can't imagine it's from research only." "Quarter of the way in I realised I was hooked by the story. [...] a well written story that crams a lot into less than 200 pages. So in conclusion another great read and one that whilst relatively straightforward is actually far from it. Unlike some books that are like a jigsaw puzzle where pieces come together I would liken this to a "Magic Eye" image - If you look hard enough you may see a completely different picture." 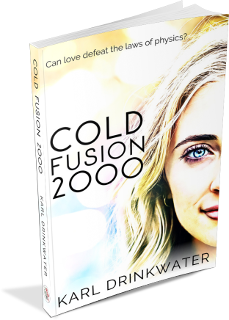 5* "Cold Fusion 2000 by Karl Drinkwater is a surprisingly powerful perspective on the life of a “loner.” Set in England, Drinkwater’s dialogue maintains the lively spirit of rural Manchester, creating an other-worldly tone. I appreciated the lesson given that we are never too old to try new things and experience a fresh outlook on life. Normally not delighted with surprises, this reviewer is delightfully surprised with Cold Fusion 2000. I really enjoyed this book." 5* "Wow ... If you love the Big Bang show, then you'll love this story. Watch out for Lucy as she's a kicker and not at all who... Never mind as that would spoil everything. This is a great love story where two lonely souls find each other. This is one to treasure and read again and again. There are no wasted words here." "Very rarely do I want to re-read a book although after finishing Cold Fusion 2000 I wanted to start again and appreciate it on an entirely different level. Thoroughly enjoyable read." "Intricate layers of family, life and love twist in to Cold Fusion 2000. With its bittersweet ending and complicated characters, Karl writes with truth and hope in this coming-of-age novel. The characters are so ordinary, yet so distinctive and have all had a taste of an epiphany in their time. The past plays a huge part of the novel, but what it truly comes down to in the end is the outlook for the future and the peace that the characters have to make with their own pasts. I was pleasantly surprised throughout the story with every new unveiling, and can say that this is a one-of-a-kind novel that can be interpreted in many different ways and that the reader plays a huge part in what they can take from the enigma-filled novel. A hugely inspiring novel that I adored from start to finish." "I was hooked. [...] I don’t want to say too much about the book as I don’t want to spoil it, but there are clues in the book leading up to a twist at the end. I didn't see the twist coming and only realised what the clues were after I’d read it and started thinking about how we had got there. A great book which I think every reader will interpret slightly differently and get something different from." "The characters were not the type of characters that are usually written about in books…they are flawed. They have oddities, a strange quality about them that makes you both love them and want to back slowly away from them at the same time. I loved the interactions and dialogues between Alex and Lucy/Jane and even Alex and his family and coworkers. Very dysfunctional at times and very true to life and caring at others. Realistic and true to life characters always make a story for me, of course, they aren’t the only part of the tale, but for me they are a huge part of my reading experience. [...] the characters were so compelling that I had to continue reading. Definitely worthy of picking up and testing the waters for yourself." "A banger of a read. [...] One gets the feeling from the start to keep an open mind. To tread gently and to respect their reality, whatever it is. Reading 'Cold Fusion, is like landing on the Big Bang set, trapped in Sheldon's mind. Logic and obsessive compulsive behaviours are the norm, everyone else is crazy. There is plenty of light relief, made accessible by the easy to read style, and so called normal characters, Alex calls family. It kept me engaged from beginning to end. By Fusion's end, it was a great relief to see Sheldon, no sorry, Alex, in love with Penny. No, no, not Penny........... You'll just have to read it to get the drift." 5* "So enjoyable, so mysterious. What is the reality? Can we ever really know? Is it what we, the readers, want it to be? Is our esteemed author playing with us or with the characters in this ever so interesting and clever book? It also has all sorts of interesting touches and insertions. I didn't read any of the material about it on KD's blog first and I urge other readers to follow my lead and read it with an open, uninformed mind so as to enjoy its full effect. I guarantee I will be re-reading this, it has that much depth." "At first Cold Fusion 2000 feels a bit like a mash up of The Rosie Project, the Adrian Mole series, with a touch of the humour of The Big Bang Theory, but it is definitely its own book. Opening with a cool time-line of Alex’s biggest ‘life-events’ (complete with song references), I found the book immediately interesting and engaging." "It brought back happy memories of millenium era Manchester, and captures some of the joys and frustrations of the time beautifully [...] The story is beautifully told, with multiple layers, while at the same time giving us a straightforward romance firmly rooted in family life, with all it's trials and tribulations - while also operating a shell game worthy of the late lamented Elmore Leonard, where not only does the story have a twist in the tail, but it has an entirely different story going on underneath, yet still in plain sight... This is the type of book that rewards re-reading, as you begin to spot more depth, and notice the clues you missed the first time around. [...] This is the first book I have read by Karl Drinkwater, but it will not be the last." "I didn’t pick up on all of the small details until right at the end. Now, of course, the things I missed seem obvious. It’s not so much a coming of age story (yes, some people come of age much later than others) as a reminder that we each influence the world we want. And sometimes, answers (and love itself) come from unlikely places." 5* "I found this book particularly funny [...] Furthermore, I really like the style in which this book is written, it makes me want to keep going back to read more. I would recommend this book to anyone who is willing to give it a go. I really enjoyed it." "This was a fun read - a romance with a bit of a difference that had some good twists and turns as well as some humour and poignant aspects. Set in Manchester in the year 2000, I loved all of the evocative references to music and fashion; I was at college that year myself so identified with Alex’s younger sister and her own predicament with her exams. There was a lot of attention to detail that made this a really atmospheric read. The characters have a good deal of depth to them too. [...] My favourite character was actually Natalie - a girl who wore her heart on her sleeve. It made me smile to realise that Alex didn’t pick up on just what was under his nose - typical! [...] This was a solid, realistic story about love, loss, and the choices we make. Readers will definitely identify with Alex in some way: his constant soul-searching, procrastination and continual remembrance of his lost love." 5* "Reading about what we used to have, slow (crappy) computers, the first mobile phones, the whole Y2K thingy, and I could go on and on and on....I am part of that generation and it felt like a Back to the Future trip, it was great to see how much Alex foresaw and how much technology has evolved in such a short period of time. [...] this book is way smarter than the average [...] this book is even more brilliant because we were under the skin of a very complex character. I also thought of Sheldon Cooper a lot." "I don't wish to spoil this novel for anyone, but I must say, it's a very good read. The two main characters are stunning in their utterly blatant humanity. They are engaging, absorbing, and wonderful. I found myself losing whole chunks of time in this book without realizing it, that's how entertaining it is. The author is able to capture the complexity of thought and emotion that goes into every moment of being an individual and their relationships with those around them, while maintaining a very charming wit. Very well done. I very highly recommend this book." "I really began to warm to, and feel for Alex as his life at home moved from one disaster to another, and he became more and more alone. The return of his ex girlfriend and all the twists that involved was great, I found myself desperately wanting it to work out for Alex and 'Lucy'. The end was not as I was expecting, it could have gone several ways and kept me guessing right to the end. A good book with twists and turns, and great characters with plenty going on." "I enjoyed this book immensely The main character, Alex, was odd but real. I thoroughly enjoyed his dysfunctional relationship with his family, especially the scene when he is at his family party. [...] I found myself cheering for his relationship with Jane/Lucy [...] I respect Mr. Drinkwater tremendously for his bravery with this view into the themes of closure and moving on. I love novels which change perspectives throughout the story and he uses this format in a new and effective way. [...] A solid, enjoyable read!" "I absolutely loved it, it's really intelligently written." "Although it is described as an adult contemporary, I found it to be much more intelligently written than most contemporary novels [...] The descriptive style made the characters and locations come to life [...] I loved the development of the characters and found each of them relatable in some way, although they were all distinct from each other and completely realistic. [...] One of my favourite things about this book was the level of research that was evident throughout. As someone that has a keen interest in art, the scene in the Whitworth gallery was one of my favourites – the vivid descriptions coupled with the opinions of both characters involved really drew me into the scene and kept me captivated. I finished this book in about a day and I am completely in love with Karl Drinkwater’s writing style. At only 200 pages, it makes a short yet thought-provoking philosophical read full of quirky science-fiction references and well-built locations and characters. I would definitely recommend this to adult readers of contemporary literature and I can’t imagine not picking this up again at some point in the future." 5* "This was a very clever book, so delightfully different from what I expected. [...] this is not the usual romantic comedy.. [...] There are a couple of interesting twists that lead to an ending that just tickled me! I will read it again (and look forward to reading more by Karl Drinkwater)." 5* "As the story line develops it grabs you and you find yourself completely unable to put the book down. You care about the main character, you care about the story, you are disappointed when you are finished. You long to meet other people who have read it, and discuss the plot and the metaphors at length. If it was a play, I would give it a standing ovation. Bravo!" "I love science and the people who pursue it. I love romance and the people who pursue it. I love good writing and editing. This story did not disappoint." "This is almost a coming-of-age story. A reminder that maturity is not all-encompasing, Some things take longer to grow. A look into how powerful a pull our past can have on us and how much it can affect us, but we all have the power to change that. The past does not hurt us because we try to move on, it hurts us because we do nothing. A simple change in attitude can completely alter our perceptions and the way we are perceived by others. A bittersweet, slightly confusing ending, that leaves a little hollowness, along with new, tentative hope. A small hint- the story is not always as black and white as first it seems. You really have to pay attention to the small clues in this book. Remember everything. One tiny, little detail can change how you perceive the entire story. The revelation that comes with understanding, only adds to the bitterness left at the end. There's a few different interpretations of this story, that are each entirely down to the reader. You'll be wondering long after the pages (or in my case iPad) close. This is the perfect re-read. [...] It is the ending that makes this book. A plot that seems so ordinary, and sometimes disjointed, becomes an epiphany, but only for the reader. That is what makes it so good. For the characters, the story is simplicity itself, but for those reading it, it is hours spent wondering. Thinking back, seeing clues that could point in so many different directions. An almost personalised book- each person will get something a little different from it. [...] overall, this is a simple plot about living. Moving on from your past and yourself. In the end, the world is what we make of it. Not positive or negative. A neutral that waits for us to imprint on it." "Refreshing. Like a few stories rolled into one - the 30-something academic living unwillingly at home, physics obsessed and socially awkward; the identical twins, one of whom broke said academic's heart, the other hoping to heal it for him; the smitten friend. [...] I recently read Geek Girl and The Rosie Project concurrently with this and it's in good company." 5* "Fascinating, unpredictable outcome with refreshingly intelligent characters. A great companion to a rainy day and a cup of tea. Looking forward to more from this author in any genre." "Mr Drinkwater has cleverly interwoven an intricate thread around signposts rooted in physics, mathematics, and even neuropsychology [...] The writing is wonderfully warm, descriptive, even faintly blokeish so that I constantly called to mind Simon Pegg in the role of the protagonist Alex. I noticed that the style changed regularly, at times rhythmic for which I comfortably settled into a John Cooper Clarkeish narration, perfect for the turn of the century Manchester setting, and at others more straightforward prose, a clue again no doubt. With a cast of supporting characters which could have been hewn from Mrs Brown's Boys, there are really very few who really matter, namely Alex, Lucy and Jane, and the beautifully portrayed Natalie. Alex is 30 year old teacher, who as a student fell in love and had his heart broken by his muse Lucy. As so often happens, he becomes bitter and no other woman will either do or is to be completely trusted, and so he floats between his work, paternal home and the pub. [...] the characters and relationships drawn are very human and tangible, recognisable to anyone who has loved and lost, then drifted through life whilst others seem to have it all. Equally realistic is the chasing of a muse (in this case a love interest, yet no less applicable to wealth, fame, power, ambition) so potent yet so destructive as to leave one blind to the possibilities which exist close at hand, patiently waiting to heal, soothe and show you the right path to the soul's satisfaction." 5* "Very Poignant, concise, and perfect; a lot is conveyed in very few words. This particular book was incredibly funny and charismatic with well developed characters. The characters felt real way before the story dives into them. Cold Fusion 2000 is a first-person narrative of a nerdy guy who figuratively is on the verge of willfully putting himself into a coma. That's how I visualized the character's personality anyways. [...] The dialog really won my heart over <3. [...] A Funny, Charming, Engaging, and Delicious little voyage." "It's rare to find a book that makes you laugh and think in equal measure. Cold Fusion 2000 does just that, as Drinkwater explores that time between leaving university and life starting in earnest, a time that should be filled of hope for the future but that all too often is full of longing for the past. [...] The writing evokes a rare sultry summer in Manchester at the turn of the Millennium - sticky buses, sweaty staff rooms, stifling heat. [...] Alex and Jane are great characters. Alex a frustrated physicist, kicking himself about things he should have done. Jane with a joie de vivre, trying to make amends for things another has done. The scenes in which they are together - particularly those set in the gallery and at the house party - are highly charged and full of longing. I read Cold Fusion 2000 on a train between London and the Peak District. I couldn't put this moving account of growing up and letting go down until it had reached its surprising conclusion." What a playful style of writing you have in this book. I've heard that people from Wales don't like being called British, so I'll say it this way. You're wording is super Welshy! Such a nice change up from all the American books I read. Hi Kyle, thanks for the comment, it made me laugh! It's also great to get some feedback, I've been worrying that no-one would 'get' the book or appreciate it. Now I know that at least one person does! Who wouldn't 'get' this book, it might be emotionally deep, but it'd think anyone could relate to it. I have a theory on why you called it Cold Fusion (the 2000 is obvious), but I don't want to share it yet. In my mind you choose 2000 (as you said in your description) because it was a time when everyone was optimistic. Which is great since Alex, especially in the start of the book, is said to feel like he's a soon to be nihilist with a very clinical view of the world. Yep, Alex is definitely on a long downslide of pessimism at the start of the novel (I'm wary of saying more because of spoilers if you've not finished yet). Once you've finished let me know what you think the Cold Fusion means. I'll be doing an FAQ on the novel at some point and will be including that as one of the answers (as I did with Turner: http://karldrinkwater.blogspot.com/2012/10/turner-faqs.html).